IrfanView for Windows XP - software for working with raster files. 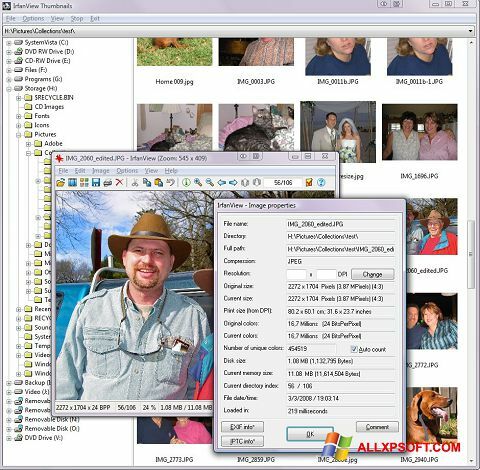 The utility includes the functionality of a full-screen image viewer, file manager, modules for converting and converting data. The application allows you to process objects in batch mode, perform image correction operations, rename and transfer images from external devices. The program supports the integration of third-party extensions and codecs for viewing multimedia data, the ability to create presentations or a slide show in the .exe extension, can work in a portable mode using the command line. You can free download IrfanView official latest version for Windows XP in English.